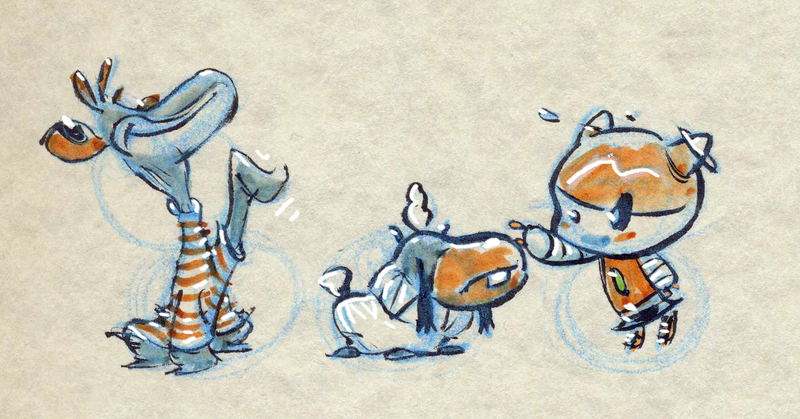 I apologize for the lack of a new strip today – I have a good excuse, but I’m not at liberty to say just yet. However, here are a few things to tide you over until Monday when Ellie, Jeff, and Muffin return. First off, we want to wish farewell to the Space Shuttle Discovery! She landed for the final time at Kennedy Space Center yesterday, ending a mission begun in 1984. 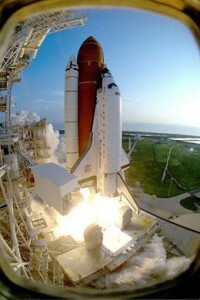 Discovery is the workhorse of the shuttle fleet, having spent the most time in space. If you happened to be an astronaut on that final flight, you were awakened on your last morning in space by the voice of Captain James T. Kirk himself, William Shatner, delivering a “These are the voyages of the Space Shuttle Discovery” speech. How cool is that? Next, I want you to head over to Tom Dell’Aringa’s comic Marooned!Tom just ended his current storyline and he’s getting ready to start up the next chapter in the saga of Captain John, Azimov, and the rest. Now’s a good time to jump in. Convention season has started. As Ellie is pretty new and I have no merchandise to offer yet, I won’t be sitting behind a table any time in the near future. I will, however, be attending a few conventions coming up as a buyer of all things cool and comicky. I’ll be at S.P.A.C.E. in Columbus, Ohio on Saturday, March 19. I’ll also be visiting Wondercon in San Francisco, probably on Saturday April 2nd. If you’re a comic creator with a table attending either event, let me know. I’ll at least stop by and say “hi”. Otherwise, you can look for me. I’ll be the guy looking particularly normal, not wearing anything to stand out from the crowd. 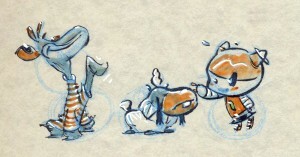 Lastly, here’s a morsel from my sketchbook featuring our three heroes! Jim, make sure to swing by my table (#55) at S.P.A.C.E. and say hello! Not cool Anderson, not cool. I know! I know! I’m sorry! I really do have a good reason (it has nothing to with Ellie). I just can’t say at the moment.